Union Home Minister Shri Rajnath Singh said that there is no better place in the world to celebrate the Festival of Peace than India. Addressing the Festival of Peace programme organized by the Rashtarya Isai Mahasangh here today, Shri Rajnath Singh said that India is the land of peace where all the religious communities have been living together in harmony for centuries. India being the harbinger of peace and tolerance, one can find all the six sects of Christianity, 72 sects of Islam, Parsis and Jews living together peacefully, the Home Minster added. 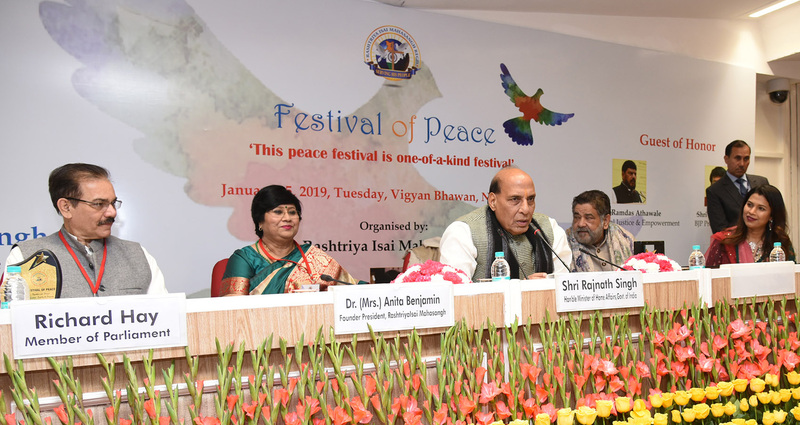 The Union Home Minister, Shri Rajnath Singh addressing the gathering at the Festival of Peace, organised by Rashtriya Isai Mahasangh, in New Delhi on January 15, 2019. Speaking on the issue of conversion , Shri Rajnath Singh called for a national level debate with an open mind by all the sections of the society. He said that in other countries where majority rules , the minorities demand implementation of Anti conversion Law whereas in India the demand for anti conversion law comes from majority community. Appreciating the efforts made by the Rashtrya Isai Mahasangh in organizing Festival of Peace, Shri Rajnath said that history of Christianity in India is older than Europe as St. Thomas came to India in the 1st century itself. . On the occasion, the Union Home Minster, Shri Rajnath Singh also gave away the peace awards to the organizations and persons who worked towards it.